Lately I have been extremely busy at work and for the las two-three months had no opportunity to visit a shooting range, and consequently did not write anything for the site. Last week, however, I had a few breakthroughs on my software work, and decided to reward myself with a few hours of shooting. I wanted to review a CZ 452 Scout rifle for a very, very long time, and now the chance have finally presented itself. Next to me at the range was a couple of friends shooting an AR-15 at 50 yards, so I kept overhearing their conversation. One friend, apparently with some military experience, was teaching a friend who was completely new to shooting how to fire his new rifle. The conversation that they had reminded me how incredibly important systemic approach to shooting is. A lot of resources, on-line and off-line, focus on specific techniques, such as positions, trigger work, sights, reloading, etc. Unfortunately, none that I've seen approach shooting in a structured way, explaining when to focus on which skill, what to try and master first, and what relative impact these different techniques have on accuracy. You see, accuracy is affected by many things. The way one holds the firearm. One's proficiency in using the sights. Quality of the firearm. Quality of the ammunition. The trigger. The weather. The shooting rest. A novice to the world of firearms must master all these to become proficient. The most important thing is to not try and learn everything at once, but rather focus on one aspect - the most important aspect - at a time. In the aforementioned case of the two friends at the range, one was teaching another the trigger technique. An important skill, for sure, but not at the point when at 50 yards the shooter was still struggling to keep all his shots inside 8" black at 50 yards. Trigger skills might tighten your groups by an inch or two, but this improvement will be absolutely invisible if one can't yet use the sights. I have two things to suggest which in my opinion would make a progress of a beginner much faster. First, approach shooting skills one by one in priority order, where priority is defined by the skill's impact on accuracy. Second, while focusing on a specific skills, remove everything else that might impact the accuracy from equation. In other words, isolate the problem to one variable. If you are shooting a rifle or a pistol that only has iron sights, you must learn to use the sights before you can do anything else. Your trigger skills, your position, your breath control, your rifle, your ammunition - none of these matter in the slightest unless you can direct your muzzle into the right direction. Learning to use iron sights may be a long and frustrating process, and for the most part for the beginner shooters I recommend side-stepping this problem by using a firearm with an optical sight. Scopes, red-dot sights (later work even on many pistols) are MUCH MUCH MUCH MUCH easier to use than the irons. 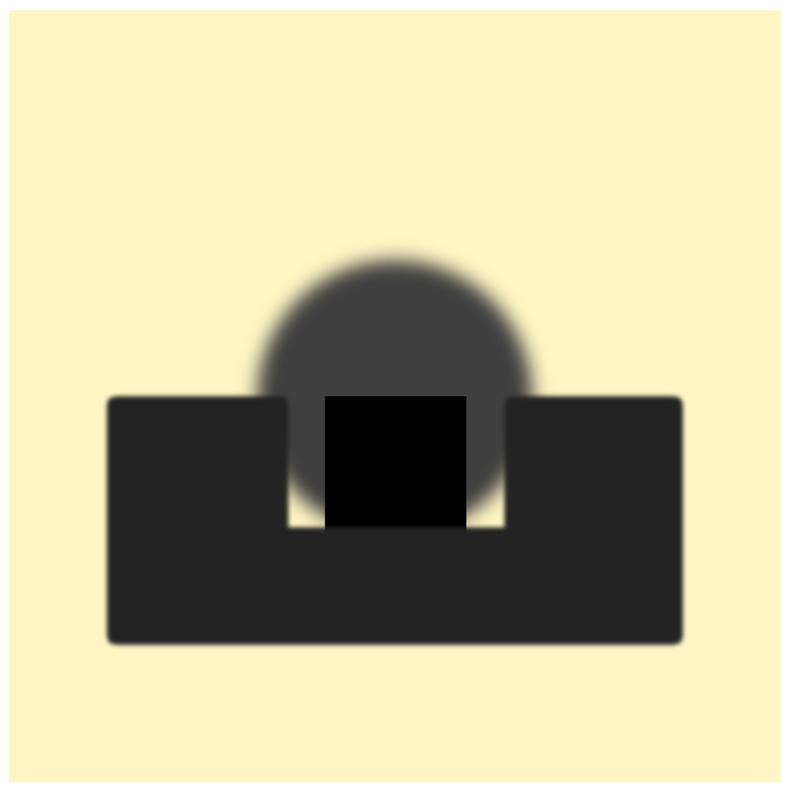 Even the peep sights, if available, would make a huge difference in your group size. If optical sight is not an option - as could be the case with many pistols - then you have to learn this first. There are tons of online sources that can help, but one that stands out is the Wikipedia article on iron sights. How do you know when you are done? You know how to use iron sights when, shooting in a supported position from the bench, your 5-shot groups at 50 yards with the rifle are no more than 3", and 5-shot groups from the pistol at 25 yards - again, supported - are no more than 5". Use an optical sight, or learn how to use iron sights before everything else. The choice of a firearm will not immediately impact your accuracy as a beginner shooter, but it will have such a lasting impact on your shooting career that I decided to cover it very close to the top. If you want to develop your skills as a shooter, get an accurate rifle in a suitable caliber, ideally, 22LR or 223 Remington. As a beginner, you are better off with a rifle, rather than a pistol, because it is a much more forgiving environment: it is easier to shoot from a supported position, the sight radius is longer so it's easier to aim, optic sights are more available, etc. If you are shooting an AK-47, you will very quickly run out of options. While the Internet has a lot of claims of 1-2MOA AK-47s, I have not yet seen one, and knowing how proficient most shooters are with data analysis, I very seriously doubt that such a thing as 2MOA AK-47 is, in fact, a thing. At 2 MOA quite a few shooting skills - breathing control, rigger control, etc - are not super relevant, so you will not have an opportunity to learn them, because the effects will be wiped out by inaccuracy of what you are shooting. I would recommend a bolt action rifle, because they are inherently more accurate. If you must have a pistol, the most accurate, yet inexpensive pistols are Ruger MKIII and Browning Buck Mark series. See more on pistols here. Cost. You need to be shooting A LOT to become good. If it costs $1 per shot, you will probably shoot a lot less than if the cost per shot is only 10 cents. Recoil. Heavy calibers put a lot of stress on your ability to control the firearm. In pistols in particular low-recoil allows for extremely accurate design (blowback operation) that isn't feasible for heavy cartridges. The best caliber for a beginner is 22LR. There are many inexpensive, yet amazingly accurate firearms in 22LR, such as Savage MKII FV or its derivatives. It is very inexpensive - sometimes only 2-4 cents a round, and usually very plentiful, although since it is not possible to reload, it is more subject to market variations than centerfire ammunition. If you must have a centerfire rifle, I would recommend 223, as it is very available, inexpensive, and there are quite a few superbly accurate, yet inexpensive rifles such as Savage 12FV. Please do note that if you are planning to hunt, 223 might be illegal for using on a medium and large game (deer, elk) in your state. It is illegal in the State of Washington. In this case, you will probably have to have a rifle in 308 Winchester, which I would supplement with a good 22LR rifle. See more on calibers here. The right choice of a firearm ulfront will save you a lot of time later in your shooting career. Holding your firearm correctly is the second most important skill that would influence your accuracy, after the sights, and should shrink your groups to 1-2" at 50 yards for a rifle, and 3-4" at 25 yards for a pistol. If you are shooting the rifle, I would recommend starting your shooting career with the benchrest shooting. Shooting from the rest is easier, and will allow you to progress faster. More importantly, it will allow you to evaluate your performance where you are holding the rifle against shooting it free recoil (see here). This way you know quite quickly whether you are doing the right thing or not. Here is a great overview of common mistakes that people make when shooting from the rest. Caldwell Rock BR Rest is an excellent alternative to vastly more expensive rests, and I would recommend Protektor bags - rear AND front - to go with it. NEVER put your barrel on the front bag, or a sand bag! People free-float barrels for a reason - the less things the barrel touches, the more accurately the rifle shoots! 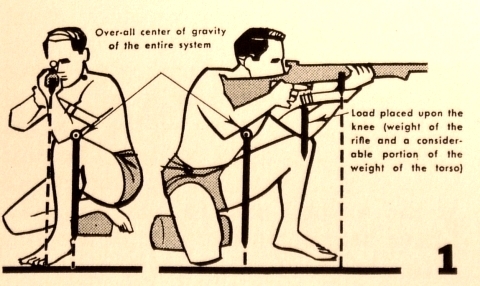 Try to maintain the position of the rifle on the rest from shot to shot, especially if the barrel is not floated. I sometimes put a small sticker on the handguard to make the position of the rifle more obvious. Do not start shooting from the bipod - it is a lot more challenging than it seems. Stick to the shooting rest or even sandbags if the rest is not available. If you are shooting the pistol, shoot from a supported position at first. Most pistol ranges would have rests available, but a bunch of sandbags and a shooting chair would do in a pinch of no other support is available. Shooting supported would let you evaluate how good your unsupported hold is. Shooting from a supported position lets you eliminate the biggest source of inaccuracy in shooting. Note: Ammunition and trigger control are very close in importance. For a rifle, ammunition is more important. For a pistol, you will get more mileage out of trigger control. Once you are approaching the point where you are shooting 1" (2MOA) groups at 50 yards, the ammunition becomes the next important factor. If you are shooting rimfire, you need to experiment with various types of ammunition. 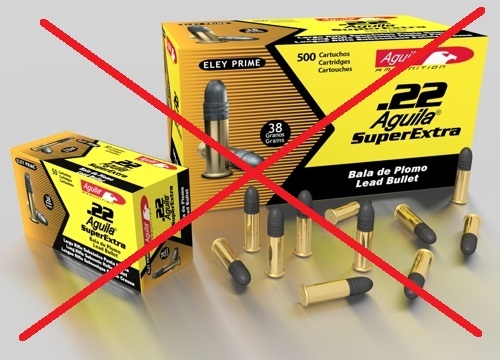 Buy a box of everything available (do not buy Aguila, however, I am not aware of a single firearm that would shoot well with it), and shoot 10 groups 5 rounds each, of each brand. Discard the first two groups, then average the rest. Whatever produces the smallest group at an acceptable price point would be what you should be shooting. Here are my notes on rimfire ammunition. 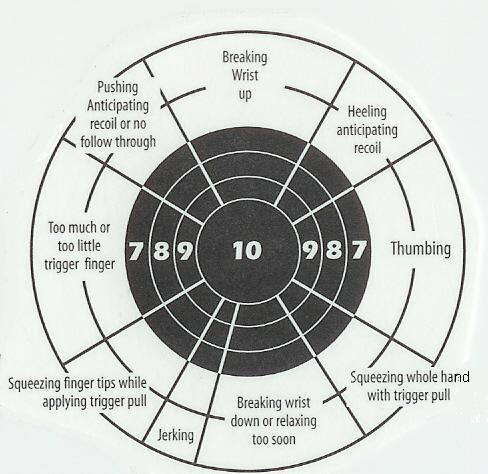 If you are shooting centerfire, this is the point at which you should consider reloading. Good factory ammunition would get you to about 1 MOA, but not much past that. When shooting a centerfire rifle, hand-loaded ammunition is required to break 0.5MOA barrier. For both pistol and rifle shooting reloading would allow you to produce a milder ammunition which is easier to shoot accurately. Internet has a lot of resources on trigger control, which I am not going to reproduce here, but fundamentally it is all about practice. You will need to master your trigger before you can get into sub-MOA territory in your rifle shooting, or below 2-3" groups at 25 yards with your pistol. Having a good trigger on your firearm helps - so hopefully yours is not a Glock :-)! See here for more. All of the above should bring you into an sub-MOA territory. To go deeper, you need to master your breath, the wind, the heartbeat, acquire great shooting equipment and really master reloading. I am not covering these areas, because they are well beyond the needs of a novice shooter. None of these will make any impact if you are already not shooting 1 MOA or less. Don't even bother! Shooting is a multivariate problem: many things impact your performance at the same time. This makes analyzing data for trends very difficult. Say, you are working on a load. You have produced several groups of ammunition in small powder increments. If you are shooting the loads with iron sights, or from prone, the variability introduced by these factors may dwarf the impact of the load itself, and make the effect of the powder charge undetectable. ...when testing your loads, use the scope, even if you normally are shooting with iron sights, and shoot from the bench even if normally you shoot prone. The difference between an accurate round and the rest can be just 0.25MOA - and that's way below variability introduced by human factors when shooting unsupported and without a scope. ...when working on your sight skills with your pistol, shoot supported. Variations from shooting off-hand are big, and will distract you from reading the sights; you will also tire quicker, and won't be able to train as long. ...when working on your trigger, shoot supported and with an optic. Everything else being ideal, this setup will give you the maximum feedback to the changes you are making to your trigger technique.